National Iced Tea Day was a few days ago! 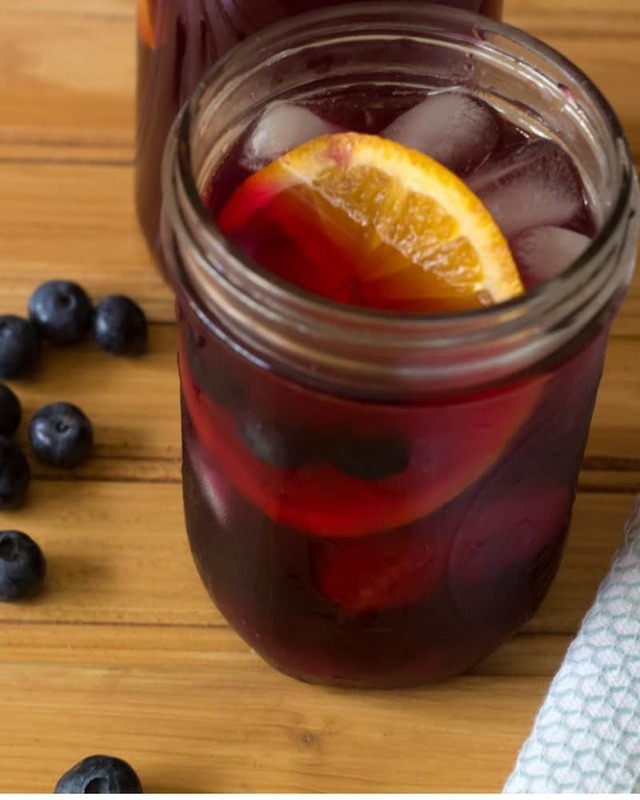 A little late with celebrating, but you won’t mind once you have tried this delicious Detox Blueberry Lemon Ginger Iced Tea! 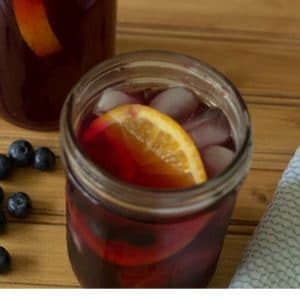 Enjoy the fresh flavors of blueberry, lemon and fresh ginger combined with a tasty iced tea that brew together to make a wonderful, refreshing Detox Blueberry Lemon Ginger Iced Tea! Enjoy all the health benefits of these fresh ingredients! This is a three for one recipe! 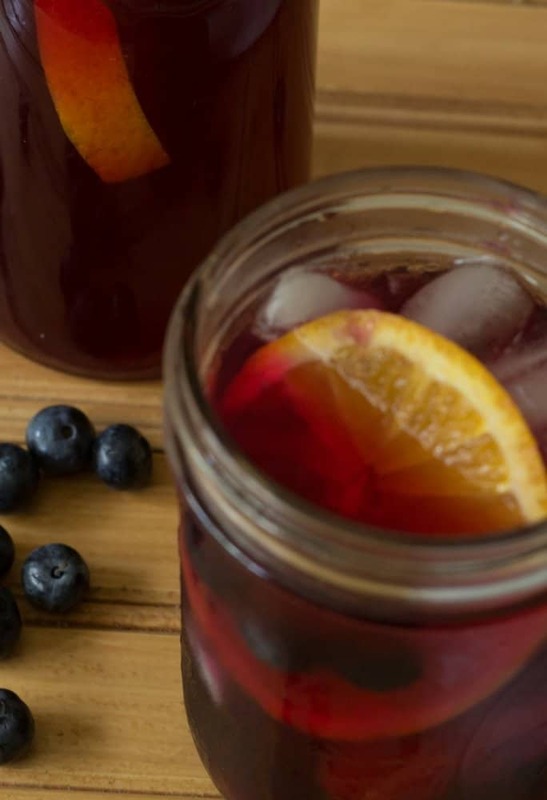 I have included the how-to recipe for those who enjoy a Boozy Detox Blueberry Lemon Ginger Tea, made with Bourbon! Want to learn how to make this tea in the slow cooker? You most certainly can do it! Little effort produces the most delicious drink! You will never buy store-bought Iced Tea again! I fell in love with Iced Tea many years ago! Being born and raised in New York, I had no idea what was happening west of the Hudson River! I became a flight attendant, based in Chicago! I had a bunch of roommates from various parts of the country. They drank homemade unsweetened Iced Tea as much as the crew I hung out with on Fire Island drank coffee! Finally, I agreed to “drink the Kool-Aid” and tried their home-made Iced Tea…that’s all she wrote folks, I was hooked! So delicious, fresh and refreshing! Really! Twenty years in New York and I had no clue that people made homemade Iced Tea. I always went to the “deli”! They had glass machines that made a lot of noise and they loaded our Styrofoam cups up with Iced Tea. Never questioned exactly how they made the iced tea! Now do not get me wrong, I do love a New York deli Iced Tea! They are awesome, almost as good as a bacon, egg, and cheese on a roll with salt and pepper! For those who have never been to New York, that is our signature morning sandwich! If the deli doesn’t make a good one. The deli’s future is over. Okay, back to Iced Tea! I am happy to say over the years, we have evolved to some pretty tasty Iced Teas here on Long Island! However, as you all know, I love to make my own. Besides being cost-effective. I control what I put into my tea, thus we have this absolutely tasty Detox Blueberry Lemon Ginger Iced Tea! I prefer green and herbal tea, as I have health issues that make having caffeine something I really limit in my life! Then there is the wonderful benefits of blueberries! My body despite a healthy diet just attracts cholesterol, so I am always trying to add foods that naturally aid in lowering cholesterol! Blueberries are on that list! My Favorite Super-food Detox Salad, is another perfect example of a salad that packs tons of flavor and just as much nutrition! You may also enjoy my refreshing Homemade Mint Ginger Lemonade always a hit and has the addition of mint and ginger! Blueberries aid in reducing cholesterol and blood pressure which makes a healthier heart. I have read studies that Blueberries have aided in prevention of loss of cognitive skills. The fresh ginger is amazing for stomach issues, morning sickness, and helps reduce bloating! Lemon, is just my friend, and is another great fruit for the body! Lemon is awesome for the skin, great for detox of the liver, and a weight loss aid! I combine all the ingredients into a large pot and bring the water up to a boil. I then reduce the heat to a simmer for 15 minutes and smash the blueberries. mashing the blueberries helps to expand the flavors and release the nutrients into the tea! Combined with the tea, lemon zest, lemon juice and ginger, what an amazing Detox Blueberry Lemon Ginger Iced Tea filled with antioxidants! 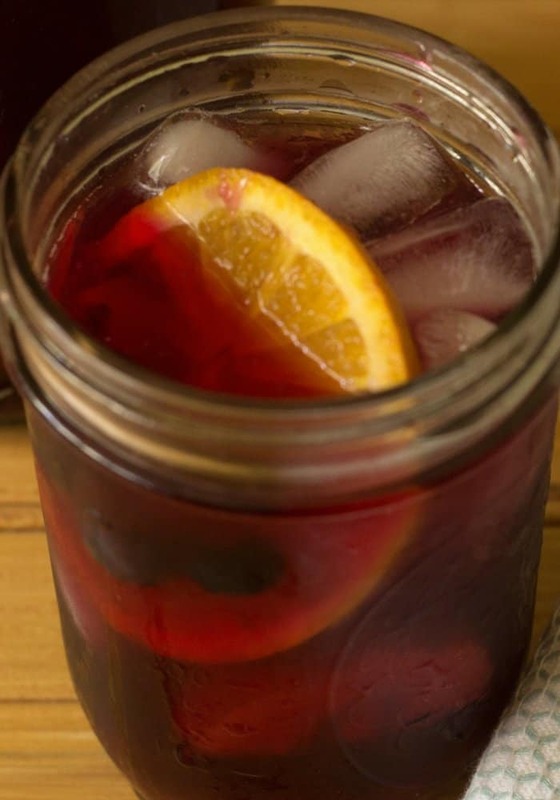 Home-made Blueberry Lemon Ginger Iced Tea is a refreshing and delicious iced tea! The health benefits are amazing, filled with antioxidants which benefit the body! Green tea, fresh blueberries, ginger and lemon juice and lemon zest make a fantastic tea perfect for any day of the week! Great for Fourth of July, Memorial Day and any BBQ all summer! If you are over 21 and prefer a boozy iced tea, feel free to add some bourbon or liquor of choice! In a medium pan, over medium heat, add the water, green tea bags, blueberries, lemon juice, lemon zest, and fresh ginger. Bring to a boil. Use a potato masher and mash the blueberries. Reduce heat to low. Cover pot and simmer for about 1/2 hour. Remove from heat. Let the mixture rest about another half hour to allow flavors to mix together. Strain the blueberry mixture through a strainer into a pitcher. Refrigerate for at least an hour. Serve the iced tea over ice and garnish with orange slices, mint, and blueberries. Total time is including the resting time of the iced tea. If you would like to slow cook this recipe, at step 1, combine all ingredients in the slow cooker. Cook on high for 2 hours, then mash the blueberries. Let cook another 2 hours. Then continue with step 3. This is also amazing as a hot tea! Can be stored for about 3 days in the fridge. I do not add sugar as I find the recipe sweet enough. Feel free to add a sweetener of choice if you prefer a sweeter tea. If you prefer a boozy Iced Tea for an adult party, add a shot of bourbon to the single serving glass of iced tea and mix well! SAVE THIS RECIPE TO YOUR FAVORITE PINTEREST BOARDS! FOLLOW ALONG ON PINTEREST! I’M ALWAYS PINNING FROM TALENTED AND AMAZING BLOGGERS WITH CREATIVE RECIPE AND DIY IDEAS! I am a tea nut and this sure sounds yummy! I will have to try this recipe for sure!